Jan. 23, 2014, 12:34 p.m.
Aaron Kushner has been a brash newspaper industry contrarian, investing in content. But over 70 layoffs last week has some wondering whether his frequent waves of change are threatening his credibility. By Ken Doctor @kdoctor Jan. 23, 2014, 12:34 p.m. Think you know what’s going in Orange County and southern California, as Aaron Kushner’s Freedom Communications unveils surprise after surprise? Think again. The most watched news-investment experiment of 2013 — with millions of dollars spent, adding 170 newsroom full-time and trainee positions and forests of newsprint — is now the scene of lots of new change, some of which seems to contradict the Register’s audacious early strategy. Soon, the O.C. newsroom may have 100 fewer newsroom staffers than it had a few months ago — though still more than it had before Kushner arrived. Kushner and Eric Spitz, Freedom’s president, wheeled and dealed their way through 2013. It was a whirlwind of change. Now a new set of shifts for 2014 has already begun. Kushner shocked his own newsroom last week by announcing the layoff of 32 Orange County Register newsroom staffers and the departure of the paper’s four top editors. More changes, not yet announced, are coming. Soon, about 75 Register journalists will drive up the 405 into greater L.A., as the Los Angeles Register launches in or around March. Around the same time, at least a couple of the much-ballyhooed Register local content expansions will be cut back, as five-day editions go weekly. Meanwhile, to the east, Freedom has wasted little time in consolidating its November purchase of the neighboring Riverside Press-Enterprise, launching a new edition, announcing a “desert expansion” of the P-E, and laying off 81 staffers in two waves. Still ahead on the agenda: selling three pieces of Orange County real estate, including the Register’s headquarters and those of a couple of smaller desert dailies (in Victorville and Barstow), paying off the Register’s debts, and completing — for the moment — of series of money moves that Kushner says will leave the paper debt-free and let it attempt to turn profitable, two years after its acquisition out of bankruptcy. And, yes, amid all these moves, some employees got mailed notices that the company had bought term life insurance on them — just as a hedge and a way to more fully fund the pension plan, which is the named beneficiary in case of individual demise. That may be actuarially sound — but given the confluence of events, it left some employees feeling a bit ooky. Hiring. Firing. Expansion. Contraction. Selling. Buying. Zig. Zag. It may sound like barely controlled chaos — a set of moves that has raised eyebrows skyward across the industry. But for Aaron Kushner, it’s all in a year’s work. “Just running our game plan,” Kushner cheerily offered this week, as we talked through those zigs and zags and numerous others. “Our strategy hasn’t changed.” What others see as lurches in strategy, Kushner sees as tweaks. That’s the world we are moving into. Once the fraternity of newspaper owners — who, when they sold properties, usually sold to one another — began to break up in the Great Recession, new entrants began to take over big properties, from Boston to San Diego. Some will break the heritage china, no doubt, and there will be collateral damage — as there almost has to be whenever slow-to-change enterprises get a remake from throw-out-the-rules entrepreneurs. Let’s try to pick out of some of the newsonomics of Kushner’s many moves, and the strategies behind them. When Kushner took over the Register in summer 2012, it had, by most tallies, about 198 newsroom staffers. At its peak, it has had either 380 or 400 in total; the company has issued different numbers on that at different times. The Register says it will have 370 newsroom people, after the layoffs. Seventy-five of them will be dedicated to the L.A. Register; about 20 are dedicated to the new Long Beach paper. That would leave 275 to cover Orange County, 45 of whom are “trainees.” These are full-time staff, making about $10 an hour plus housing stipends — young journalists essentially being given one-year make-or-break jobs. Though many make significant contributions, let’s take them out of the count for a moment, which would leave 230 full-time professional journalists in O.C. That’s still 32 more than what the Register had 18 months ago. But the number puts the major expansion in perspective. If more than 32 additional layoffs are necessary any time soon, the Orange County news operation would find itself — minus the trainees — with less staff than when Kushner bought it. To be sure, it would be still one of the largest hirings of journalists in the U.S., when the vast majority of metro papers are either flat or shrinking. It’s simply worth noting that the intensive upgrading of Orange County coverage — the early strategy’s hallmark — has been significantly downgraded. What’s behind the Register’s changes? We can chalk up it up to two things: marketplace performance and Freedom’s opportunistic orientation. 2013 was an unprofitable year for Freedom, with the company likely down in low single-digit millions month-by-month. That’s not surprising, given the moving pieces. It added staff costs of more than than $15 million, hiring all the additional journalists and about 200 new staff on the business side. The trainee program costs more than $1 million. Then there’s the additional newsprint investment and further contributions to shore up the company’s pension plan. The Register that Kushner and Spitz took over operated essentially on a break-even basis, with total revenues in the neighborhood of $175 million. We know some things about the company’s 2013 operating performance and can extrapolate a few more. As a private company, Freedom only likes to drop a positive number here and there. It has cited circulation revenue as being up 16 percent, based largely on the rationalization of its pricing. That would mean additional revenue in the $7 million to $10 million range. That gain would have been somewhat offset by losses in digital ad revenue. The Register’s hard paywall sent traffic down 40 percent, and with that came double-digit losses in digital revenue — which Kushner acknowledges is a quite small part of his revenue mix. Though sources put the pre-Kushner digital revenue at more than $20 million, he says that number is way high. In any event, reader revenue gains were countered by significant digital ad loss. Kushner maintains that print advertising managed a small gain in revenue year-over-year, which would differ from the overall industry’s continuing high-single digit loss. Then, again, the Register investment in newsprint product and in staff to sell it makes it plausible that it would have an outcome different from its peers. It’s in 2014 that Kushner says the turnaround will come. Financials I’ve obtained show a Freedom forecast of $20 million in earnings (or EBITDA), based on $254 million in total revenue. We can see how important the Riverside purchase (and quick layoffs there, is to that game plan. The Press-Enterprise produced about $6.5 million in EBITDA in 2013. Add in more than $4 million saved in the cutting of the 81 jobs there, and you have $10 million. That would be half of Freedom’s overall forecast earnings for the year. The Riverside profit, of course, will depend on how much more print advertising the paper loses. Similarly, the performance of the O.C. Register and the satellite Registers will be greatly affected by the same big factor. That’s where the Register’s true contrarian move raises questions: its embrace of print and downplaying of digital. Overall, the 2014 Freedom performance is a crapshoot. It has to find a way to resurrect its digital ad business. There have been talks about reforming the hard paywall; a metered approach would help regrow audience. It will face a tough slog in growing circulation revenue at that 16 percent pace from last year. Its one-price-fits-all, $365-a-year strategy will make it hard to find new, younger subscribers. Cutbacks in the O.C. Register may hamper subscription efforts as well. If it needs to, Freedom can do what so many of its peers have done: cut its way to profitability. In fact, in last week’s layoffs, we may seeing the start of that strategy. The Register’s continuing embrace of print — especially as it has moved into Long Beach and now into L.A. — is perplexing. The rest of the newspaper industry is moving away from it, at differing speeds. Aside from that significant distinction, and Freedom’s newsprint-based expansionist ways, many of its strategies more parallel its peers than differ. That makes a certain kind of sense. Kushner and Spitz bought the remnants of Freedom, and the Register had been the headquarters of that far-flung collection of properties. They sold or are selling those properties, but they’re now recreating a wannabe local chain on bootstrapped financing. Their strategies borrow both from the tried-and-true and the au courant. Buying up contiguous properties, like Riverside, pulls from old clustering playbook, one of which the King of Clustering, MediaNews builder Dean Singleton, would be proud. Buying up local weeklies and magazines is a strategy employed from Columbus to Washington; in a receding print environment, collect lots of print and use one sales and one content staff to power it. Then, there are the real estate sales. Many dailies have evacuated downtown real estate, applying the cash to their ailing businesses. Finally, the centerpiece of the multiplying Registers is content centralization: invest every dollar possible in local reporting, believing that’s the only reason readers will shell out hundreds of dollars for all-access subscriptions. Then, provide local readers with the national and global news, national business, sports, entertainment, and lifestyle content in as cost-efficient a manner as possible. Produce it with singular design and content desks, enabling technology to save as much later as possible. Freedom is doing it, and it’s quietly sweeping the country. Gannett is putting USA Today-based national sections — 10 pages on weekdays, 22 on weekends — in many of its 82 local newspapers. For several years now, Tribune has nationalized its national and global pages for seven of the company’s papers. Digital First Media’s Thunderdome is its own spin on the idea. The new Press-Enterprise includes added depth to local news, an expanded columnist roster, a new Inland SoCal Register section, enhanced design elements…The fourth section, Inland SoCal Register, focuses on top news from our community’s perspective on regional, state, national and international news. That can be a smart strategy — it’s all in the execution. In a sense, there are only two big questions about this chain strategy: How good or adequate is that national report? And what’s the level of local reporting — in volume and quality — that is sufficient to keep tens of thousands of readers paying? The Register’s competitive street-fighting is unusual in time of retrenchment. Not many papers have been raiding their neighbors’ markets lately. Freedom has been unusually aggressive, first with the August launch of the Long Beach Register and now in Los Angeles. But the impact of the forays may be marginal, aiming to pick up low five digits of circulation. The Long Beach experience, unsurprisingly, has shown that the gains come mostly in single-copy sales, not subscriptions; there are few non-subscribers clamoring for 7-day home delivery anywhere these days. While the L.A. Register is claiming countywide coverage, it will especially focus on rival Digital First Media communities — Torrance, Whittier, Pasadena — after previously launching the Long Beach Register in another DFM territory. Remember the mini-storm about the Tribune Company keeping all its newspapers’ real estate assets as it prepares to spin the newspapers themselves into a separate company? Freedom’s exploitation of its real estate shows why land and buildings can be so key to newspapers’ financial health. It already sold off one local building for $2.7 million and now plans to move the rest of its real estate in the first quarter. The estimated return: $81 million for three parcels, one of which would become an apartment complex. Freedom’s waiting until now to sell those properties helped it meet collateral obligations and wait out an improving commercial real estate market. Sources put the market improvement at 10 to 15 percent in a year’s time in rebounding Orange County. It has also sold two of the other newspaper group properties it got in Freedom’s out-of-bankruptcy fire sale for $34 million in cash. Its final disposition move is selling the last Freedom papers, in farther-flung San Bernadino County. Look for GateHouse to buy at a price of about $10 million. That’s the cash coming in while a lot of it has flowed out. Freedom invested in staff, made the final payment on its purchase agreement, and contributed to the pension fund. It cajoled financing — “it’s a tough market to finance newspaper acquisitions,” Kushner acknowledges — to complete its Riverside paper purchase for $27.2 million in November. It’s been moving forward with the final $12 million (of $30 million) preferred equity offering over the last two months, offering fairly favorable terms. In November, it had about $6 million in cash on its balance sheets. If all goes as planned, with all properties sold and operating targets hit, Freedom could emerge debt-free some time in 2014. And then there the several lawsuits in which the company is embroiled, with uncertain financial impacts. Kushner seems fairly serene for a man in the midst of so much change. Maybe that’s because he created it. True to form, he seems largely oblivious to the reaction to his strategic shifts. Asked why he didn’t explain the reasons for the Register layoffs, Kushner offers his entrepreneurial mantra of change, believing that should be good enough for the world and reminding us that he is running a “private” company. I talked to one of his investors recently and noted that Kushner could be brash; the investor said I was being too charitable. Sure, his unrepentant zeal could crown him king of L.A. newspapering. But it could also strain his credibility — among readers, advertisers, would-be community partners, possibly financiers, and certainly staff. The newsroom’s high has been punctured. Rob Curley is the new top editor. Curley is an industry innovator, whose peripatetic adventures (Washington Post, Las Vegas Sun, Naples Daily News) are well known in the industry. He found a new niche at the Register, but takes the top job with little experience in overall big newsroom management. As Kushner’s freewheeling ways inevitably blur lines (as they’ve done with school-sponsored editorial sections), how will the new editor react to unorthodox commercial forays? “Never complain and never explain” may have worked for Disraeli, but it might work less well for a community-advocating newspaper publisher like Aaron Kushner. What’s the end game here? Kushner says he believes he will be able to continue his rollup of southern California, from the brown, brown hills of San Berdoo to the Palos Verde coast (he also took control of the coastal Easy Reader this week), getting financing as needed along the way. I told him some say he is just looking for a quick flip, buying Freedom and the Register cheap and with little of his own money, selling off the hard assets of other papers, and cashing out. Only the supreme self-confidence of a Kushner could have led to such a out-of-the-gate set of innovation as he brought to Orange County as soon as he assumed ownership. Kushner burst out of the newspaper box, innovating community outreach, membership marketing, and most importantly, that totally contrarian multi-million investment in local content. 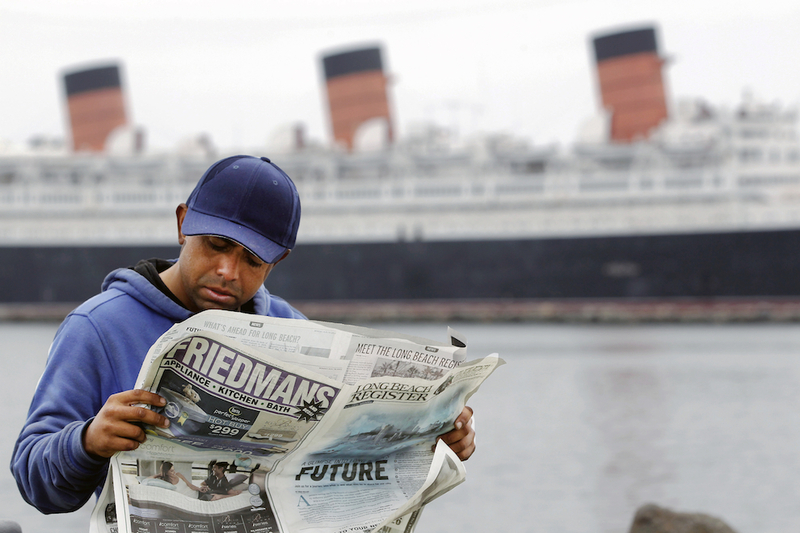 Photo of Long Beach resident Antonio Romero reading the first edition of the Long Beach Register on August 19, 2013, by AP/Nick Ut. POSTED Jan. 23, 2014, 12:34 p.m. Doctor, Ken. 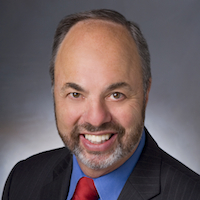 "The newsonomics of the Orange County Register’s (new, newer, newest) plan." Nieman Journalism Lab. Nieman Foundation for Journalism at Harvard, 23 Jan. 2014. Web. 25 Apr. 2019. Doctor, Ken. "The newsonomics of the Orange County Register’s (new, newer, newest) plan." Nieman Journalism Lab. Last modified January 23, 2014. Accessed April 25, 2019. https://www.niemanlab.org/2014/01/the-newsonomics-of-the-orange-county-registers-new-newer-newest-plan/.